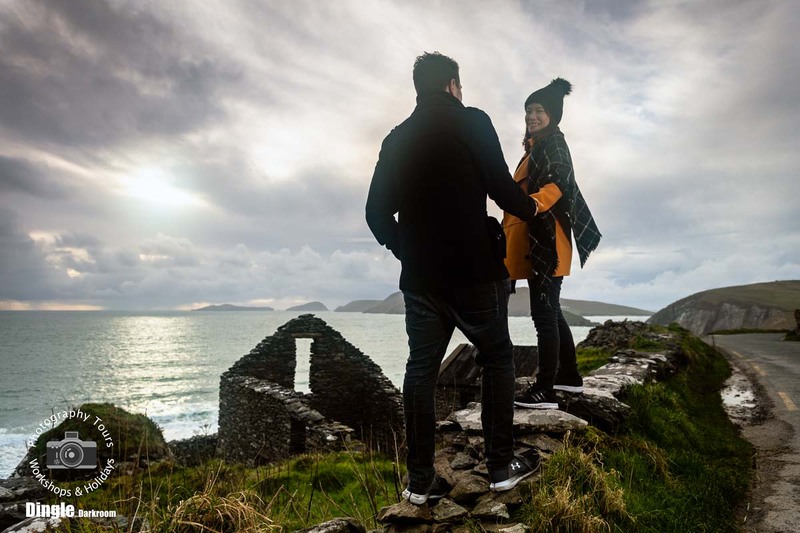 The Dingle Peninsula provides a stunning natural backdrop for engagement, couples and love photography. 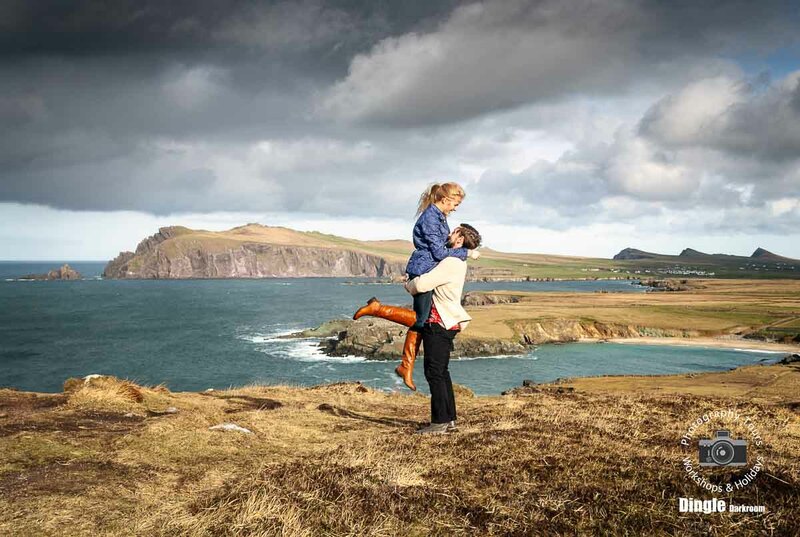 We meet up and get to know each other, as we enjoy a relaxing drive to the dramatic Atlantic coastline, west of Dingle. As we arrive at each new location, you explore the scenery together and I’ll capture some candid moments at a distance before moving in a little closer. The session is very restful and informal, although I may ask you to turn a little to catch some wonderful light or even hold a certain position on occasion. As well as the iconic locations at Slea Head, Coumeenoole Strand, Dunquin Pier, Clogher Head and Strand, we can visit some of the lesser visited spots along the rugged coastline that I’ve discovered during 30 years of landscape photography on the Dingle Peninsula. The tour is unhurried and goes at the pace you want, even if you are eager to experience and be captured in as many different places and views as you possibly can, we’ll never run out of great locations! You’re welcome to bring a change of outfits to create variety in your images and I’m happy to hike a little distance for a further touch of solitude and seclusion at some of the lesser visited spots I know along this spectacular coastline. This session may also be customised to meet your exact requirements and can even be prearranged and planned to capture a surprise proposal at your own special location. Among other options available are group and family photography sessions. Please contact us with your requirements. This tour lasts 3 ½ hours, providing at least 2 hours on location, and I’m more than happy to work around our schedules to obtain the best light possible for our shoot, although I highly recommend a morning or evening tour for the best possible light. We’ll take many images together and all the captured images will be transferred to a USB drive for you to take away with you. You review the images and pick 15 you would like professionally finished for viewing, printing and social media use. Your finished images will be delivered via email in the following days with a download link. Additional images can be ordered and professionally finished at €5 per image. 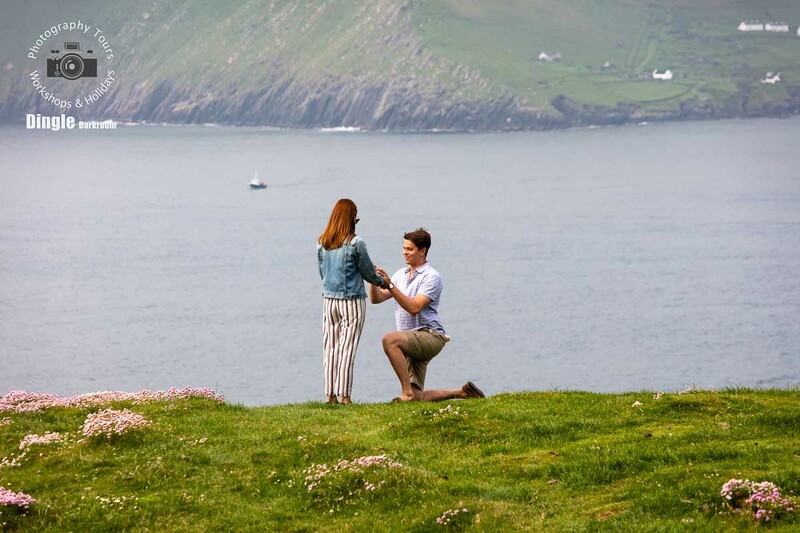 A wonderful reminder of an engagement, wedding or visit to Dingle. If you would like to present this tour and photo shoot as a gift for an engagement, wedding or any other occasion please contact us.